This is because the EU directive which capped the prices mobile phone operators could charge each other will no longer apply to the UK after Brexit. But Brexit Secretary Dominic Raab told the BBC that two mobile operators had agreed to keep free data roaming. The document says that “in the unlikely event” of the UK leaving the EU without a deal, consumers should “check the roaming policies of your mobile operator before you go abroad”. The government has published its latest contingency plans in the event of a no-deal Brexit. The cabinet met earlier for a three-hour no-deal planning session, which included a presentation by Bank of England Governor Mark Carney. Mr Raab said the government was aiming to get a Brexit deal with Brussels by mid-November at the latest but was stepping up contingency planning in case that did not happen. He insisted this was not a “threat” to the EU but a “statement of fact”. 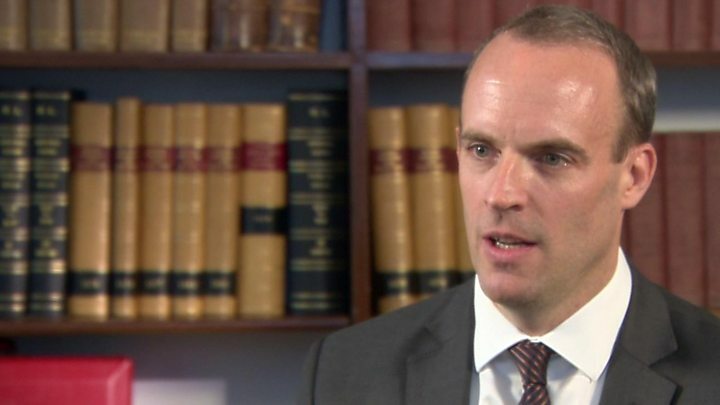 A senior EU diplomatic source told BBC News Mr Raab’s words were “a statement of the obvious” as the financial settlement was part of the withdrawal agreement. Will there be roaming charges? That’s the public message coming from the UK mobile phone operators about the threat of higher costs for travellers from a no-deal Brexit. But off the record there is a subtler message – it all depends on what our continental colleagues do. Roaming may be free for customers but not for the operators. Every time you use your phone abroad your home operator is charged a fee by the one you are using abroad. That rate has been capped by the EU as part of the abolition of roaming but once the UK leaves all bets are off.